They have had a good life at our farm and now they are are ready to become top quality, pastured, organic and soy-free chickens for the table. We raise meat birds for market in the fall and because of popular demand, we raised a few more than we usually do this year! Due to spending their days outdoors eating grass, bugs and soy-free feed, they remain healthy and happy. As a result, their meat is tender and delicate and high in the nutrients and benefits that prevail in pasture-raised meat and eggs. Our birds are processed humanely, by us, and at our farm. They are available October 16 – 24, fresh OR frozen, after that they will be available frozen only until they are sold out. Visit our Chicken Page for more information. 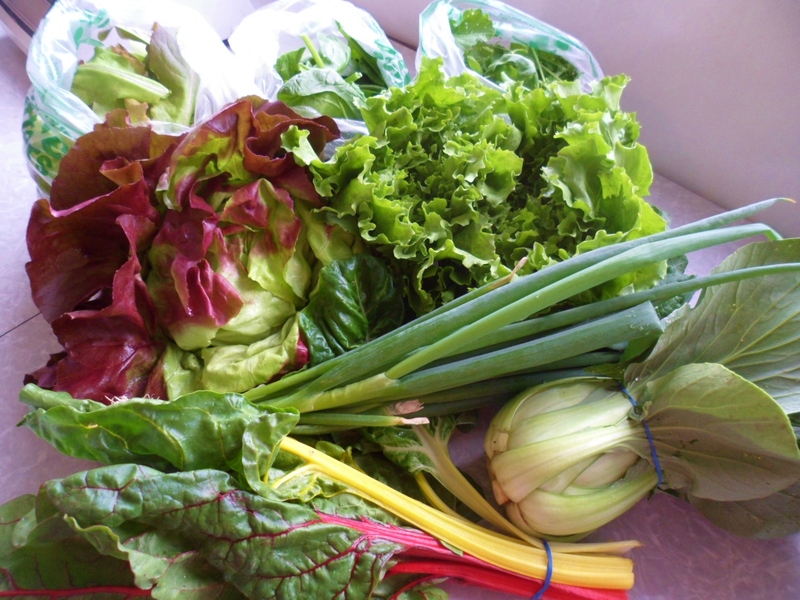 Email or call to reserve: highmeadowfarmcsa@gmail.com. 920-699-3658. This entry was posted in Chickens & Eggs, Uncategorized and tagged fresh organic chicken, organic chicken, organic poultry, Pastured chickens on 21 Oct 2016 by Meg. 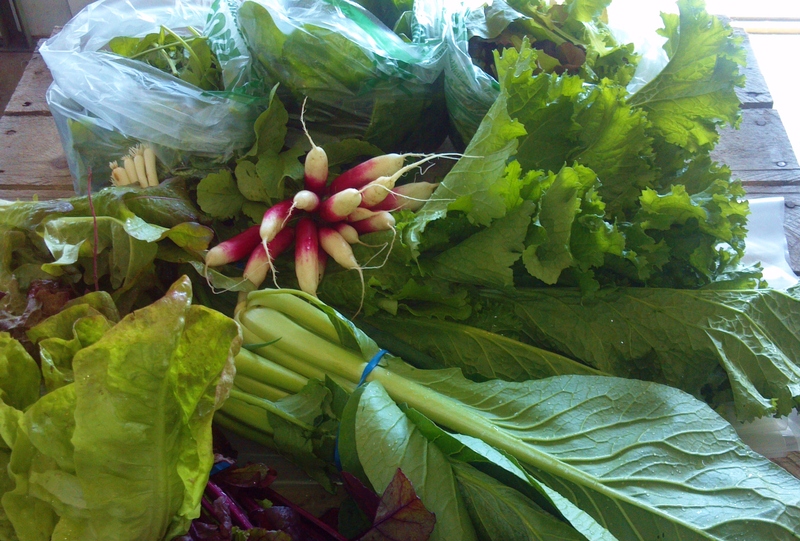 Lots of veggies, sinking their roots into rich soil! After the weather finally improved and the snow melted this spring, the work on our new barn finally started progressing. Our old barn has been converted to our cooler, washing and packing area and the animals have been uprooted and are in need of a new location away from our work space! The new barn has access to nice pasture and it is nestled into a protected spot. We have also added to our fruit orchard this year! 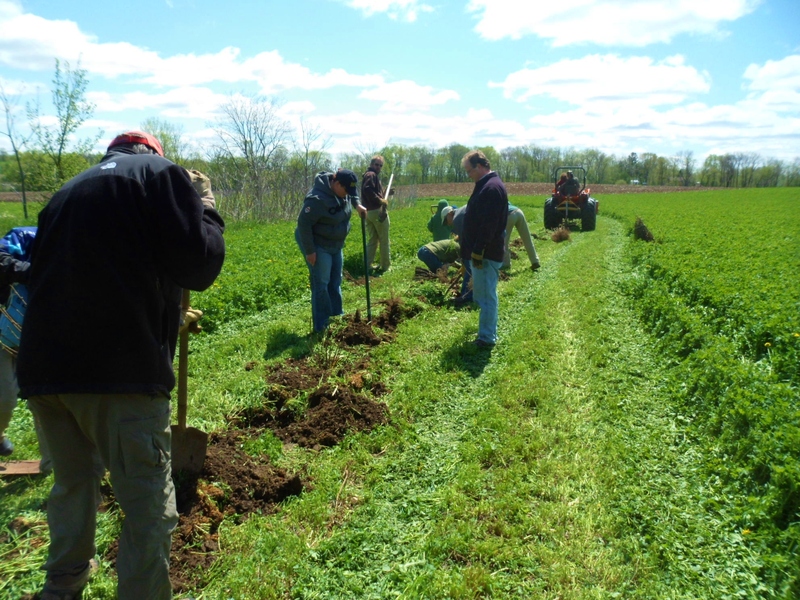 Mother’s day here turned out to be a great day for friends and farm members to come and help us add 100 red currant bushes, 25 Juneberries and more apple and pear trees to the orchard! And everyone who helped did so willingly for a simple scrambled egg breakfast! (The work crew had pie, though.) This past weekend, we planted 10 more large cherry trees and more rhubarb plants and now we are done with the big trees for this year. We are looking forward to adding fruit to our member’s boxes soon! It is too early to tell if there will be much this year yet, but we are hoping. The rhubarb and raspberries that we planted last year will be surely ready for shares next year. If you missed the planting day and are feeling left out we do still have about 50 hazelnut’s that need to be planted (very small ones) and there are also some small oak trees to plant. We have a few more white pines and Frasier fir’s that we need for now and would be happy to give them away to a good home! An awesome and eager planting crew planting 100 currant bushes on Mother’s Day! 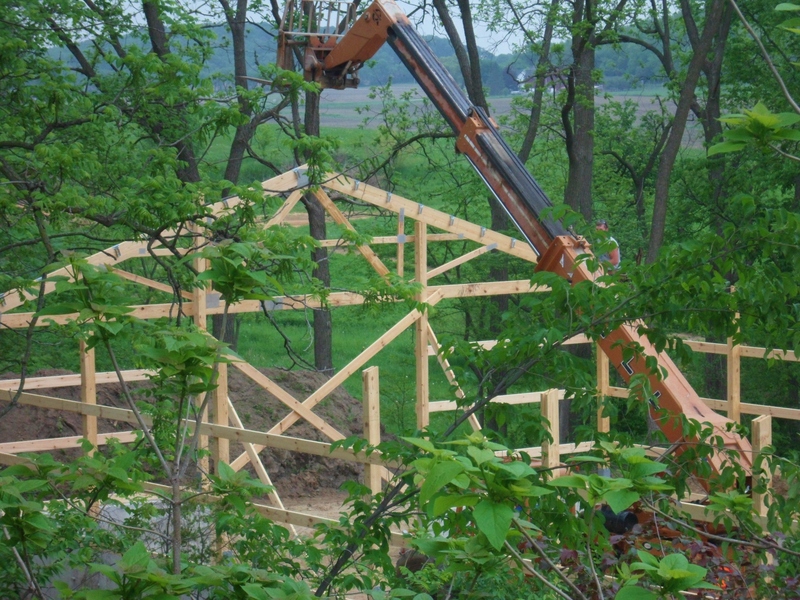 They are setting the rafters on the barn; just before they were rained out by a 1.75″ deluge. 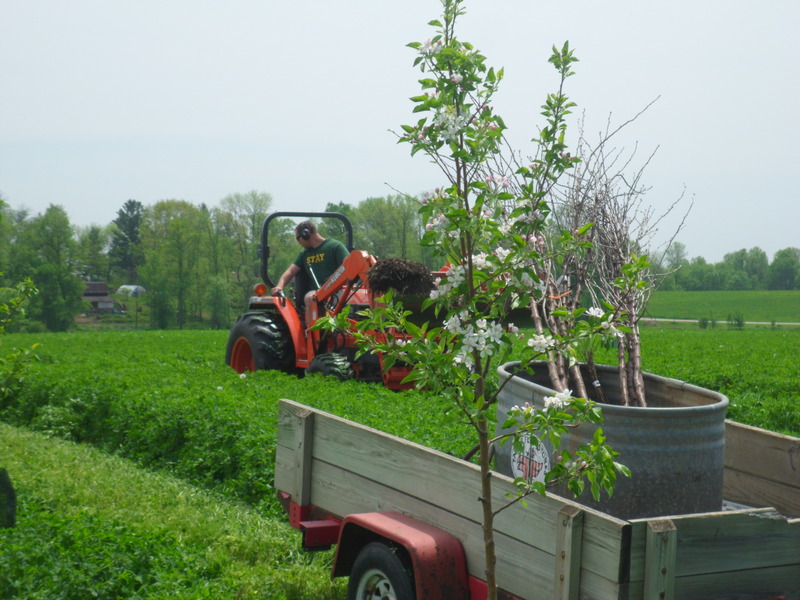 Finishing up with the cherry tree planting. Blooming here is a semi-dwarf Golden Delicious apple tree! This entry was posted in CSA, Events, Produce Shares, Uncategorized and tagged bread shares, CSA, CSA shares, egg shares, Fort Atkinson, Jefferson, Jefferson County, Johnson Creek, Lake Mills, Oconomowoc, Pastured chickens, spring shares, Veggie shares, Watertown, WI on 23 May 2013 by Meg. We have had the good fortune this spring to have housed a fairly nice rooster that has now left his legacy in our 17 adorable, fluffy chicks. Although it is always fun and rewarding for us to raise chicks from our own hens, we usually make a point not to have a rooster available in the spring to make this possible. This time it worked out well for us! Big, bad Mario in 2008. I learned the hard way that roosters don’t make good pets. I still have the beak-shaped scar on my arm to remember the day that I tried to talk to my “pet” rooster, Mario about his rude behavior to our guests. He was not in the mood. It was spring. He had only the hens in mind and scoffed at my perceived friendship. As we stared at each other in contempt, I wondered what I was thinking. He is an animal that acts instinctually. Of course he would be nice to me in exchange for food during the off-mating season. He even let me pet his pretty feathers. I remembered how my mother once made “pets” of some wild raccoons that were vandalizing our garbage cans nightly. They completely turned on us when the Ritz crackers ran out and Mom had to call the animal control people. That was years ago, when our flock was small. Since then, I rarely keep roosters past 5 months of age. I don’t befriend them either, preferring to keep them a bit leery of me and other humans. 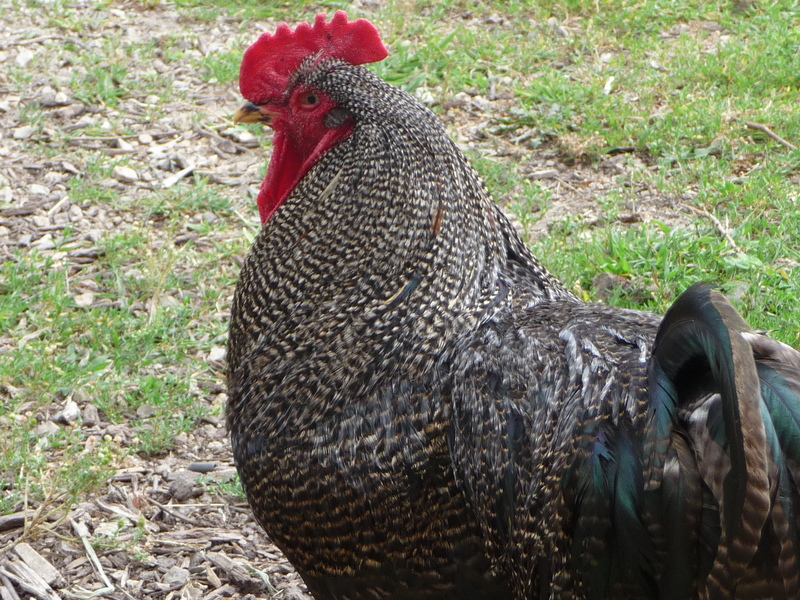 Mature roosters will challenge visitors and small children and can be very aggressive with our dog, Leo as he simply goes about his evening chores of herding the chickens into their housing. However, last fall, as we sorted the roosters from the flock, we apparently had one that was left behind due to his remarkable quiet, hen-like behavior (and hence; disguise). His breed (Cochin) and slower development played out in his favor. He was allowed to spend the winter months with our young pullets* that had not started laying eggs yet early in the season and that worked out just fine. 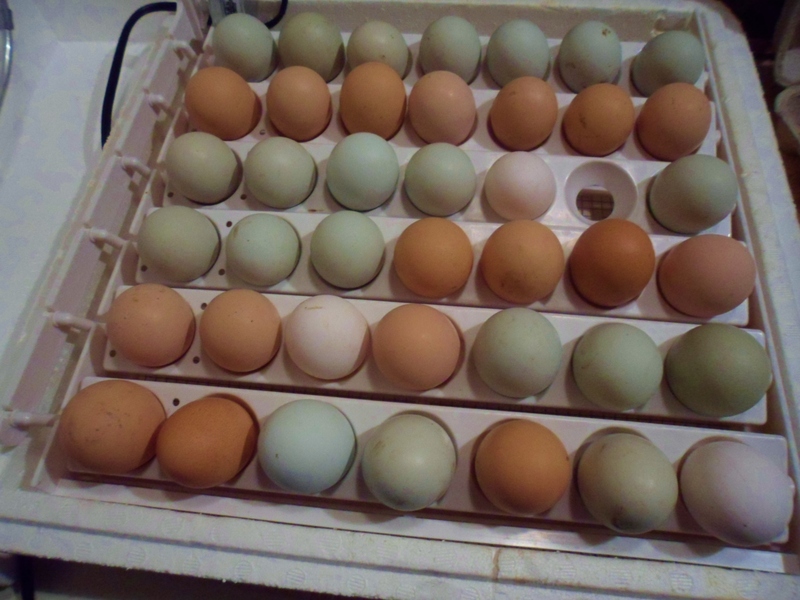 In February, the pullets began laying eggs and the rooster became sexually mature which resulted in the majority of these young hen’s eggs being fertile. Our incubator filled with eggs for hatching. Not all will be viable; they will be candled to check for development about a week after they start incubating. The development of the embryo doesn’t start until the egg incubation temperature is brought to around 99°f; the temperature that a hen will keep them at when she begins sitting on the eggs. That is why a hen can lay several eggs in a nest over a week or more and then have them hatch 20-22 days after she begins setting on them. As an alternative to a setting hen, we us an incubator. When our rooster found a new home last month, we set an incubator’s worth of eggs aside to hatch. With no rooster on the farm now (except perhaps in the brooder right now!) none of our eggs are fertile anymore and there is no chance for them to ever become chicks. Cute little chicks all dried off and into the brooder to keep warm and safe. Although there is little difference between a fertile egg vs. a non-fertile egg other than a cloudy spot on the yolk or in the white, our fertile eggs have been used for our home use or sold to customers that ask for fertile eggs. We do this for consistency in our egg quality; non-fertile eggs will keep longer than fertile eggs and sometimes, even the cloudy spot causes some concern to people that are not accustomed to farm fresh eggs. 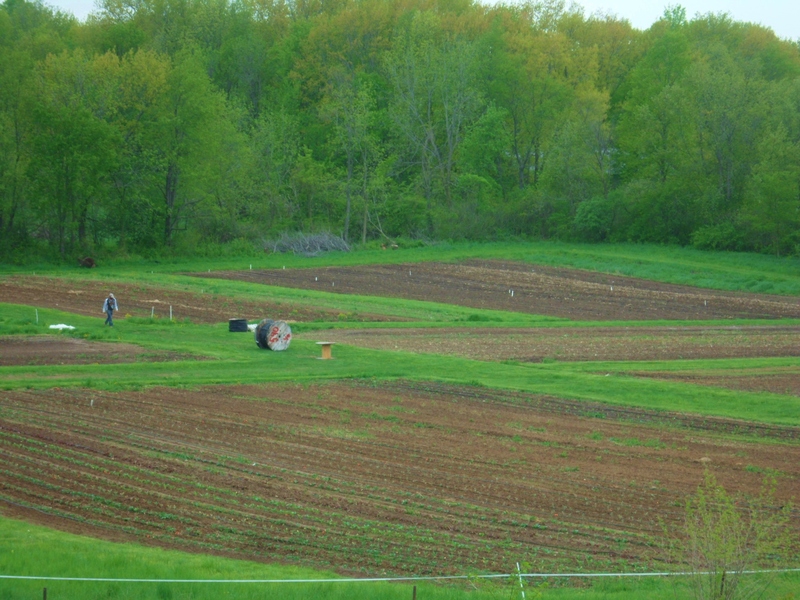 We have and still do raise several different types of birds on our farm. Different breeds will meet different goals when we are raising chickens and the same goes for turkeys and ducks. We like to have some diversity in our laying flock, but the majority of our laying hens are Rhode Island Reds or a similar breed. Although Rhode Island Reds can get broody* at times, this trait has largely been bred out of the breed, but they are prolific egg layers. The ones that do choose to set on eggs often have very short attention spans for the task and may end up abandoning their eggs before hatching. 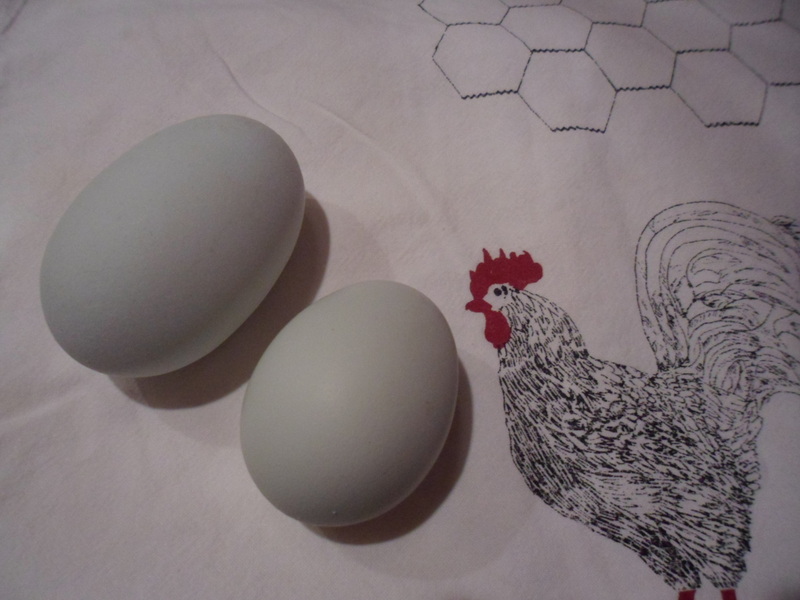 Other breeds that we have in our laying flock are Auracana’s; bearded ladies that lay blue and green eggs, Dark Cornish (pinkish eggs), White Rocks (white eggs), Barred Rocks and Delaware (brown eggs) and Lackenvelders (small, white eggs). All of these, with the exception of the Lackenvelders are nice dual purpose breeds, meaning that they are good for both egg laying and as meat birds. We also raise a few flocks of Cornish Cross chickens that are raised entirely for meat. Our flock sizes more than double in the warmer months as the chickens have access to outdoors and are allowed to forage and graze, but the flocks are never so large that the hens are stressed, crowded or more than our farm dog, Leo and I can enjoy caring for or manage to round up in the evening. In the winter, we reduce our flock size, bringing a smaller percentage of our laying hens into the barn with access to the outdoors when weather permits. “Mother” our old Banty hen who is at least 12 years old. Mother laid 5 eggs in this nest last week. Because they were not fertile, I switched them with some that had been saved (not incubated) from our incubation clutch, but they are about a month old. Oh well, they’ll have a better chance of hatching than her little un-fertilized eggs. We’ll see what happens in a few weeks! 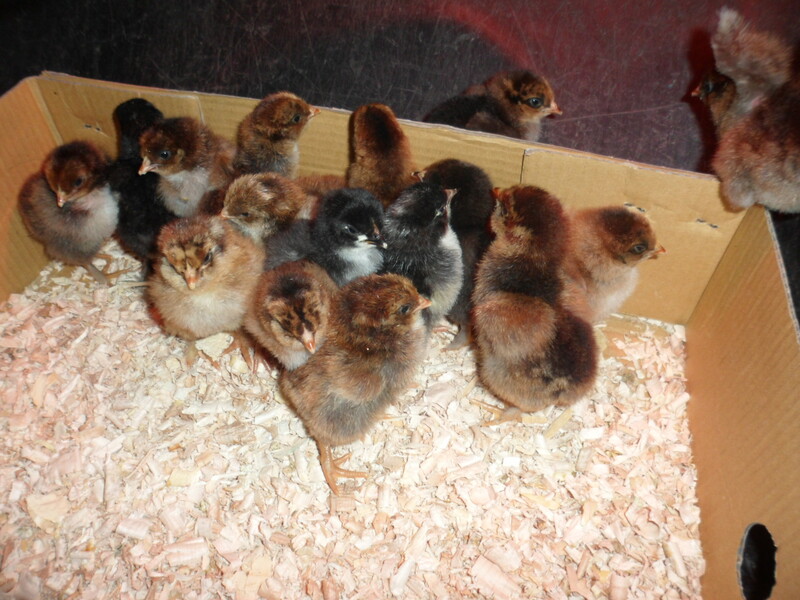 Some of our hens are acquired through mail-order as chicks or from a local hatchery. They are raised organically from the time they hatch, allowing their eggs and their meat to be certified organic. We usually order “straight-run*” which provides us with a number of roosters in the mix. As the chicks grow, the pullets will join the laying flock and the roosters will become meat birds (before they become mean birds!). 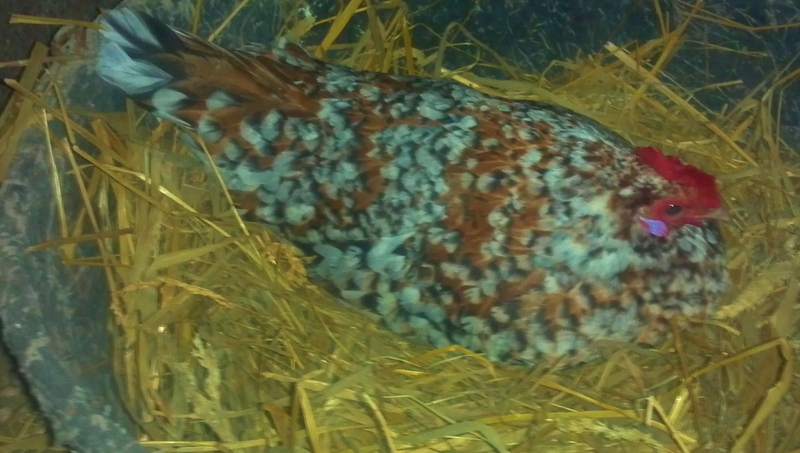 If we do decide to keep a rooster for breeding, we often hatch our own eggs in the incubator. We also will switch a hen’s unfertile eggs with fertile eggs if she is broody and we believe that she is up for the task of setting on her clutch* for 21 days. Usually the hen that we depend on the most to hatch a clutch of chicks is Mother, our tiny little Banty hen who is 12 years old and can still lay a nest full of eggs when she is in the mindset to hatch them. She is the best mother chicken that I have ever known and we love her very much. The best time to collect eggs for hatching (if you have a rooster) is in spring, when the grass is green and the days are getting longer. 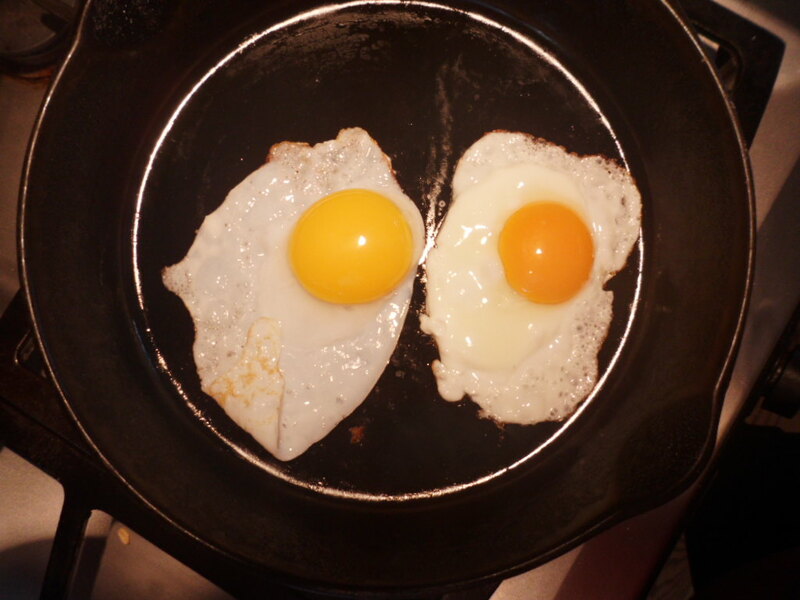 It is also a time when you can notice the greatest change in the yolk color and flavor of the eggs! The chickens are busy and happy and all of this is reflected in their eggs. The eggs get larger in spring, too; often resulting in eggs with double yolks! If you are still curious for more information about how the chicken got into the egg, there are more egg facts and a few definitions if you click HERE. 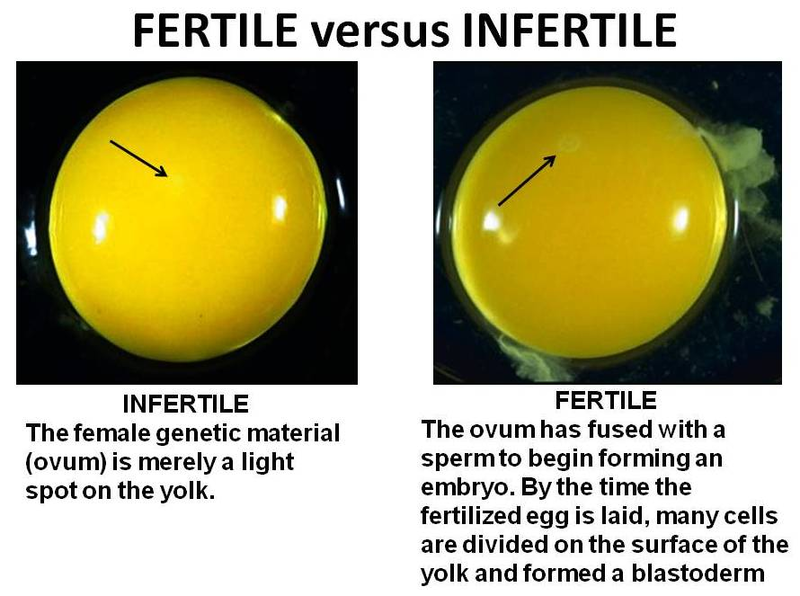 To see what a fertile egg looks like click HERE. 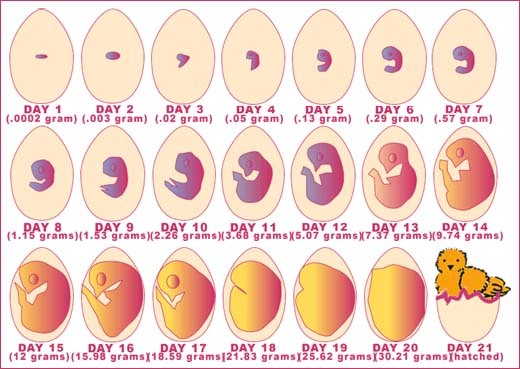 To see a nice chart on the developing stages of an egg, click HERE. This entry was posted in Chickens & Eggs, Uncategorized and tagged broody hens, chickens incubator, fertile eggs, hatching chicks, mean roosters, Organic, Pastured chickens, roosters on 19 Apr 2013 by Meg. At a time of year when the barnyard hens of most small farms take a break from egg laying, our hens have apparently not received that memo! Maybe I am just not that great a chicken farmer…my chickens just don’t listen. I told them last fall that this was the time to rest up; we’d need their services again in spring. I guess laying eggs is one way to pass the long winter days when the snow is too deep to play outside, (If you are prone to do those things, that is) and long winter days they have been this year! I have personally been entertained daily by seeing the expressions on the ducks and chickens each day when their doors are opened to snow, then puddles, then ice, rain, snow, puddles, ice, snow, more snow, wind….although their expressions aren’t so much of surprise anymore as they are disappointment. After a few warm days of puddle-hopping I think they are ready for warmer days to stay around again. After all, it is almost chick season! Duck egg, left- chicken egg, right. Our lovely little ducklings have grown up into egg laying machines too, laying an egg each every day for the last 2 months now. Indian Runner ducks such as ours have a reputation for being great egg layers. Ours are also getting a reputation for being noisy. At least they are entertaining and productive though! Have you ever had a duck egg before? They are a luxury that I am getting very used to! I understand that not everyone loves duck eggs as much as I do. They are a little different from chicken eggs although not extremely so. Duck eggs are slightly larger, they have a harder shell, (sometimes taking a little harder tap on the pan to crack), the yolks will remind you of a huge orange sun and they have proportionately less white than chicken eggs. I think they are creamier and richer. (They also have more calories and cholesterol, I suppose, explaining why I enjoy them so) I am told that they also have more digestible proteins than chicken eggs making them more acceptable for people who have intolerance for chicken eggs. 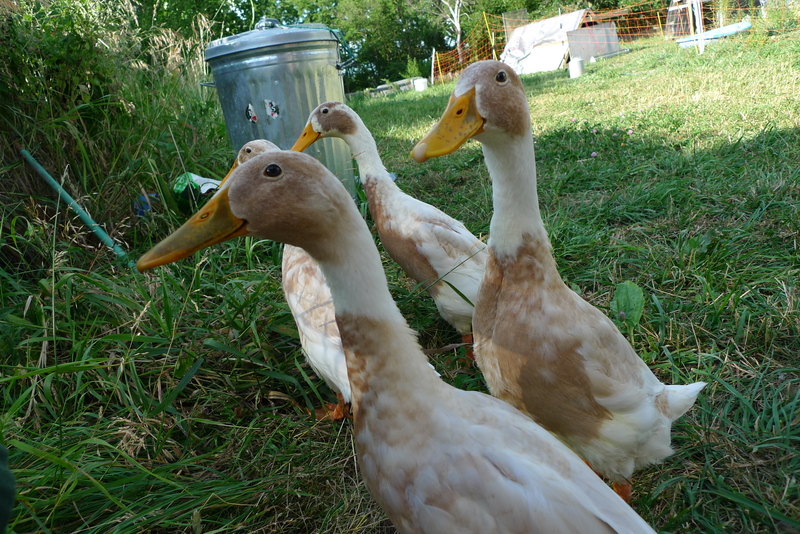 I have also found that duck eggs will make cookies and cakes fluffier which is not always desired for certain pastries, but so far, I have enjoyed baking with them and I have also enjoyed this little flock of our 5 ducks that are almost 1 yr. old! Our Indian Runner Ducklings; aka Khaki Campbell ducks. 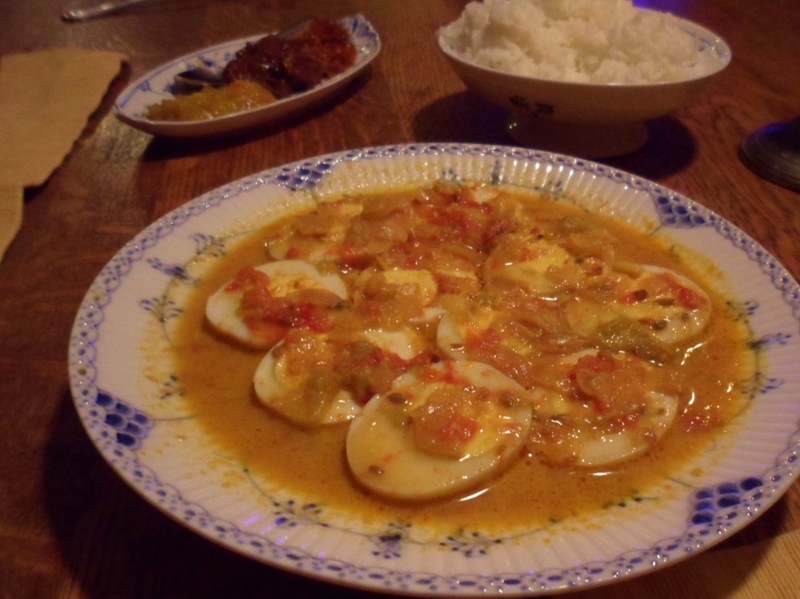 This entry was posted in Chickens & Eggs, Cooking, Recipes and tagged duck eggs, Egg Curry, egg recipes, eggs, Indian Runner Ducks, Pastured chickens on 19 Feb 2013 by Meg.